In Thursday's semis, Serena will play Russia's Elena Vesnina and Venus will take on Germany's Angelique Kerber. "We don't really talk too much about it but we are playing doubles later, so we are just happy to be in the semi-finals," Serena told BBC Sport. 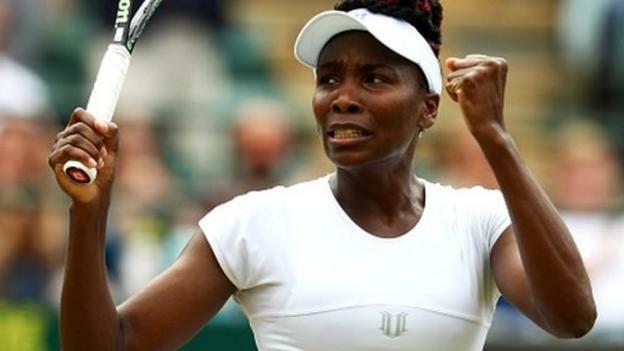 Wimbledon 2016: Venus beats Shvedova to reach semi-finalsWimbledon on the BBCVenue: All England Club Dates: 27 June-10 JulyLive: Coverage across BBC TV, BBC Radio and BBC Sport website with more on Red Button, Connected TVs and app. Click for more detailsFive-time champion Venus Williams reached the Wimbledon semi-finals for the first time since 2009 with victory over Kazakhstan's Yaroslava Shvedova.Eighth seed Williams - at 36 the oldest Grand Slam semi-finalist for 22 years - beat unseeded Shvedova 7-6 (7-5) 6-3.An all-Williams final remains possible after top seed Serena beat Russian Anastasia Pavlyuchenkova 6-4 6-4.In Thursday's semis, Serena will play Russia's Elena Vesnina and Venus will take on Germany's Angelique Kerber. "We don't really talk too much about it but we are playing doubles later, so we are just happy to be in the semi-finals," Serena told BBC Sport. Asked about a potential final meeting, she added: "It will be great. Venus is such a tough opponent I want her to win so bad - not in the final if I am there, but if I'm not, I do. "Kerber, the fourth seed, beat Romanian fifth seed Simona Halep 7-5 7-6 (7-2) in the opening match on Centre Court.Unseeded Russian Vesnina thrashed Slovakian 19th seed Cibulkova 6-2 6-2 in the remaining quarter-final on court one. Wimbledon 2016: Angelique Kerber beats Simona Halep - 5 best shotsAustralian Open champion Kerber edged past Halep in a contest of terrific rallying, with returns very much dominating over serves.There were eight successive breaks in the first set, and 13 in total, but the Centre Court crowd was thrilled by much of the shot-making.Halep was always coming from behind before ultimately succumbing with a double-fault to hand over the first set, and despite twice recovering breaks in the second, a rash of errors gave Kerber a deserved win in the tie-break. "I think actually it was a good match, on a really high level from both of us," said the German. "There were a lot of breaks but I think because we are both great return players, it was not so easy to serve actually. It was a really high level match." 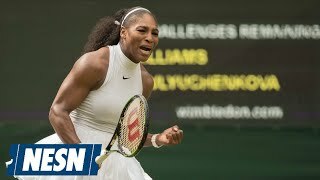 Wimbledon 2016: Venus & Serena Williams lose a point in bizarre fashionSubscribe to the BBC Sport newsletter to get our pick of news, features and video sent to your inbox.